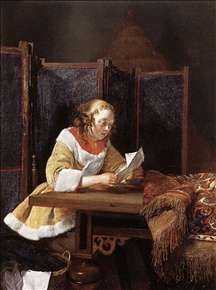 Terborch s father had been an artist and had visited Rome but from 1621 was employed as a tax collector. Surviving drawings made by the young Terborch in 1625 and 1626 are proudly inscribed and dated by his father. 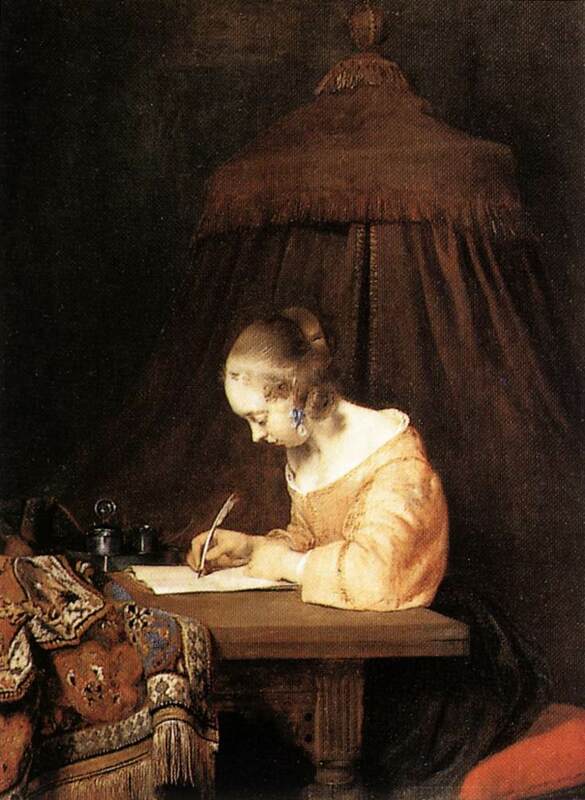 In 1632 Gerard was in Amsterdam, and in 1634 he was a pupil of Pieter de Molyn in Haarlem. 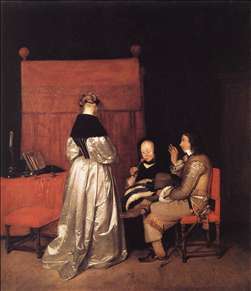 He visited England in 1635, Rome in 1640, and from 1646 spent two or three years in Mnster, Westphalia, where the peace congress was in session. 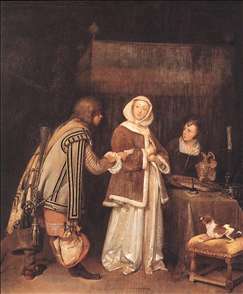 The masterpiece of this period, The Swearing of the Oath of Ratification of the Treaty of Mnster (1648), portrays the delegates of Holland and of Spain assembled to sign the peace treaty. 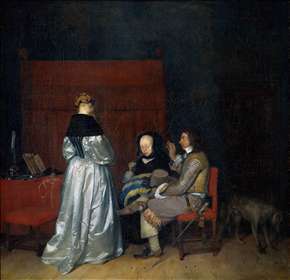 After a stay in Madrid he finally returned to his own country at the end of 1650, and in 1655 he settled in Deventer. 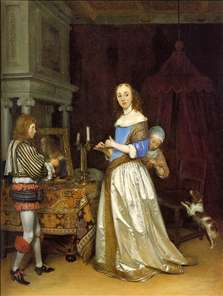 Terborch s works consist almost equally of portraits and genre pieces. 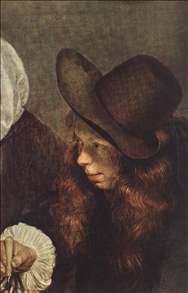 His characteristically delicate technique can be appreciated in the portraits, which are painted on a small, almost miniature scale, though many of them are full-length. In colour they tend to be subdued, due largely to the sober costume of the times, but by subtlety of tonal gradations and mastery in rendering diverse surface textures he was able to achieve an extraordinary richness of effect. Particularly characteristic is his manner of rendering satin. His superb colour sense appears to greater advantage in genre subjects, though it is always employed with masterly restraint. 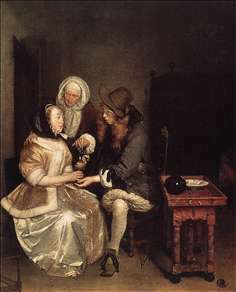 In his earlier years he painted many guardroom subjects in the manner of Pieter Codde and Willem Duyster, but later, from about the time when he finally settled in Holland, he painted calm, exquisitely drawn groups, posed easily and naturally against shadowy backgrounds and imbued with an almost aristocratic elegance that is unique among Dutch painters of his time. 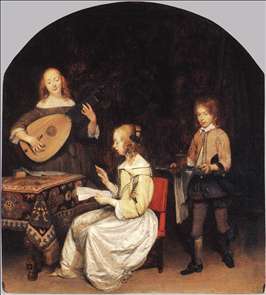 Among many fine examples of Terborch s art are The Letter, The Concert, and Paternal Admonition. 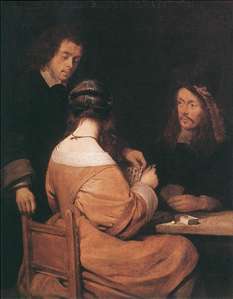 See more details about "The Letter"
See more details about "Lady at her Toilette"
See more details about "A Lady Reading a Letter"
See more details about "Paternal Admonition"
See more details about "Woman Writing a Letter"
See more details about "Paternal Admonition (Gallant Conversation)"
See more details about "Card-Players"
See more details about "The Glass of Lemonade"
See more details about "The Glass of Lemonade "